SERVPRO of Danbury/Ridgefield can respond to your commercial restoration emergency. The technicians are trained with drying equipment and containment for your water, fire, mold, or storm loss. Call us anytime 24/7. 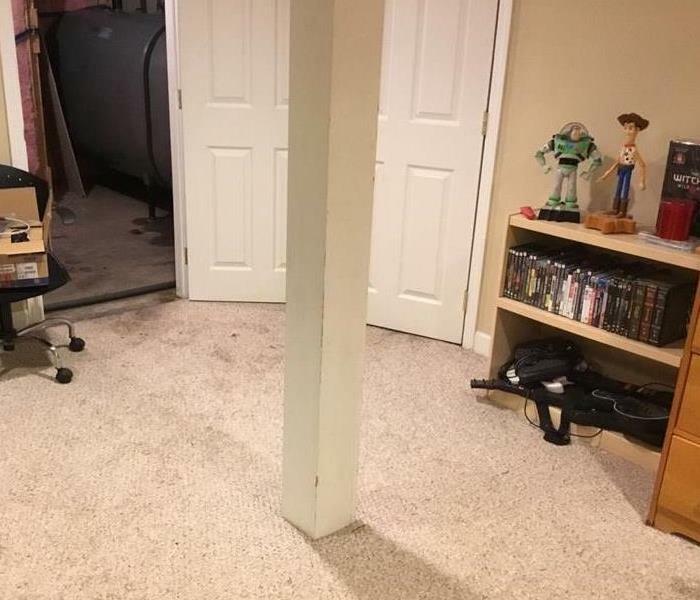 This room suffered from a water loss. 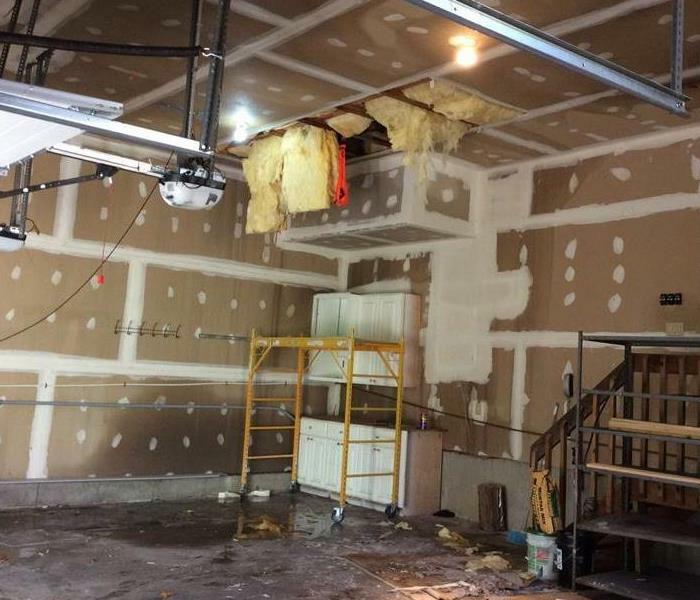 There was significant water damage on the ceiling drywall and floors. 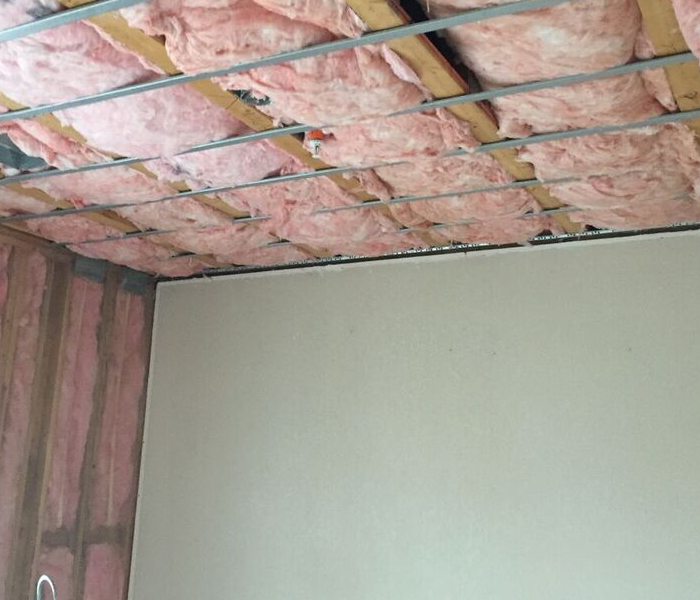 The drywall was torn out and insulation replaced to restore the room back to pre water conditions. SERVPRO of Danbury/ Ridgefield responded to this home to find significant water damage. The team has professional cleaning equipment and techniques to restore your home back to pre water conditions. Contact us for your restoration needs. 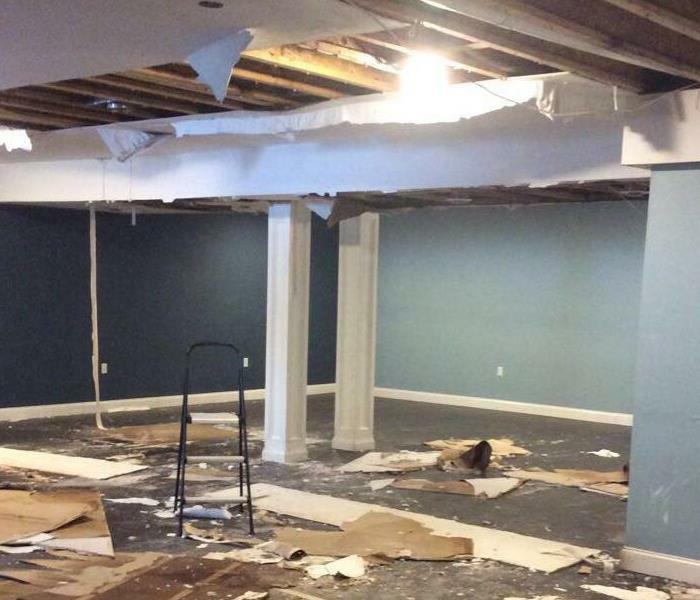 This is the aftermath of a basement after a pipe break. There was drywall damage along with some flooring damage. SERVPRO rebuilt this basement ceiling and cleaned the flooring from debris. Contact us for your construction needs. 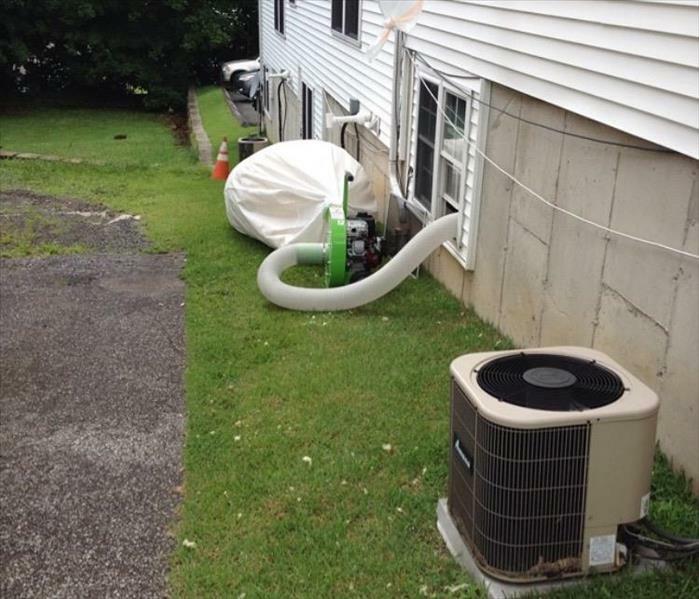 After a water loss in this Danbury CT home, SERVPRO responded immediately to begin mitigation. They provide assistance in cleaning and rebuilding your home or business back to normal conditions after any type of water, storm, mold, or fire emergency. The kitchen suffered from a water loss after a water leak was found behind the dishwasher. The dishwasher was removed and found flooring damaged. The flooring was ripped out and dried to prevent damages throughout the rest of the kitchen. After a severe storm this garage suffered from a water loss. SERVPRO responded immediately to begin mitigation. The ceiling was damaged and water was coming from the opening. The team used air movers to dry the garage floors. This garage suffered from a water loss. SERVPRO responded and cleared all content from the garage. They used professional drying equipment to dry belongings and the area. 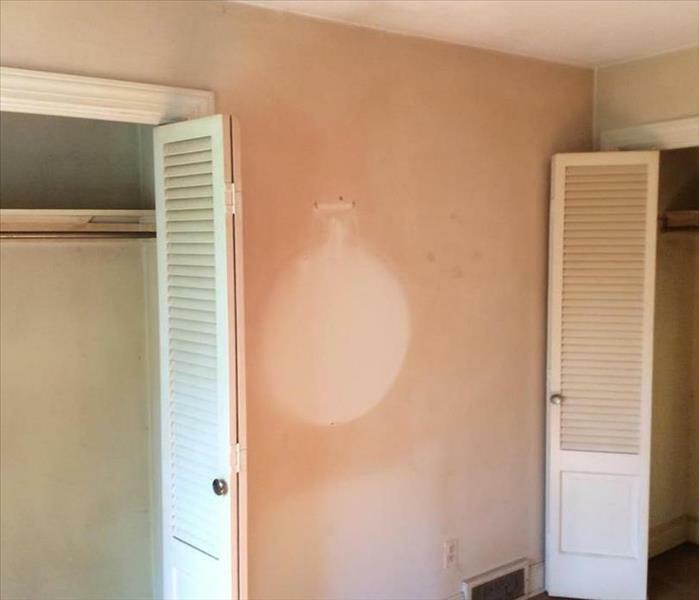 They cut out drywall and replaced areas that were damaged. This bedroom suffered from a water loss. The carpet had significant amount of water in the carpet. SERVPRO responded and bean clean up procedures. 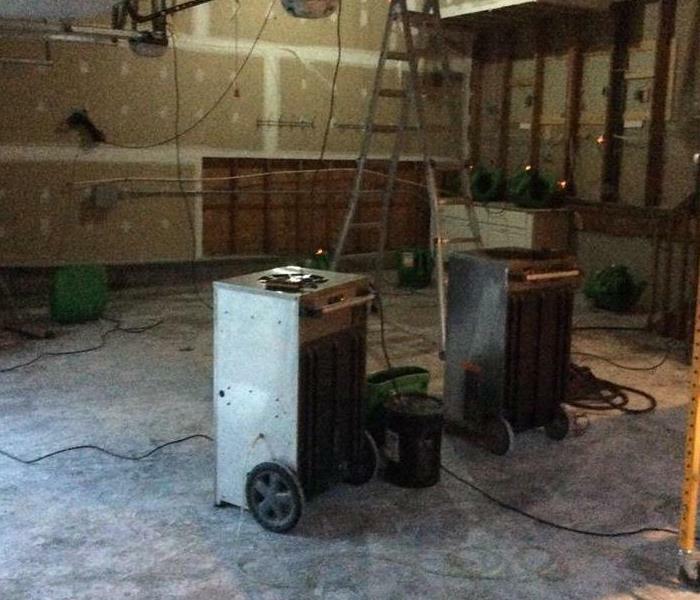 The flood cuts were performed to remove drywall and used air movers to dry quickly. Those are not spider webs. Soot webs or tags occur in a home where the smoke was hot enough to create ionized particles. The particles are drawn to each other. They link together as oxygen is starved from the air creating webs from one end to another. 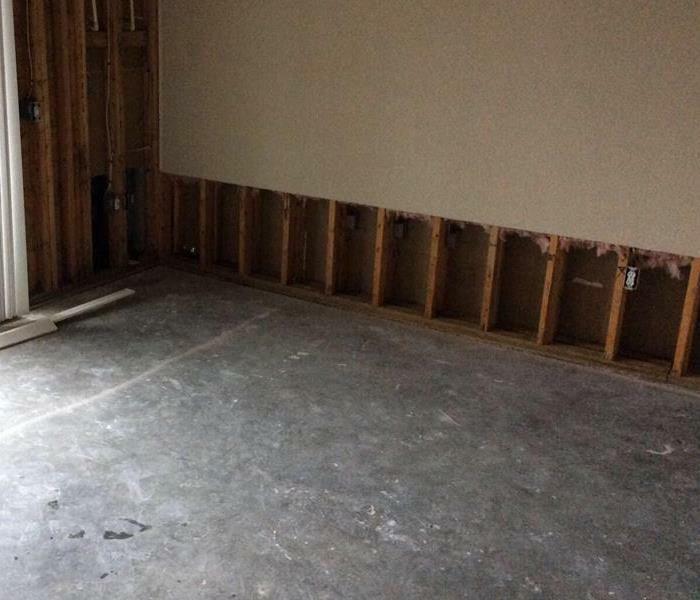 This picture is from a water damaged basement in Ridgefield, CT. The basement had an elevated flooring system allowing water to travel underneath it and affected the cavity below. SERVPRO technicians pulled back the carpeting to access the flooring system below. A cavity drying system was installed to push warm, dry air into the cavity to help dry the affected area. 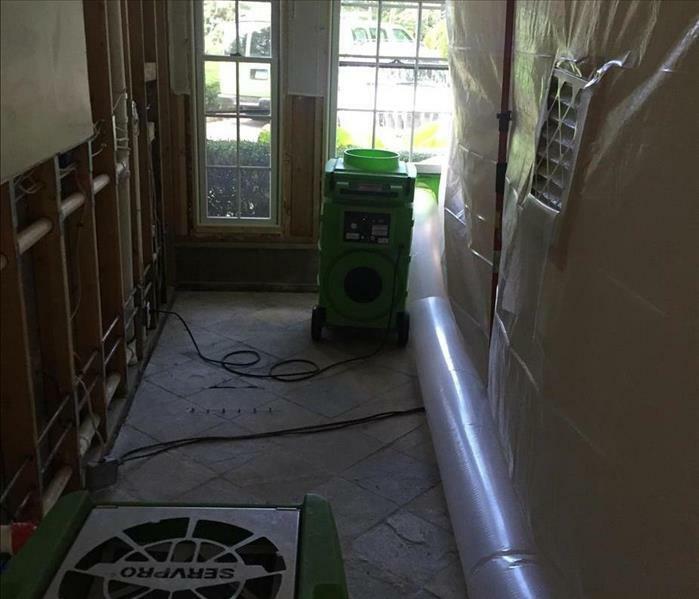 The SERVPRO of Danbury/Ridgefield team has the training, knowledge and equipment required to dry even in special circumstances. The time saved using infrared, and the larger areas covered rapidly by an IR Camera, can save time and money by providing a faster, more efficient and more reliable survey. 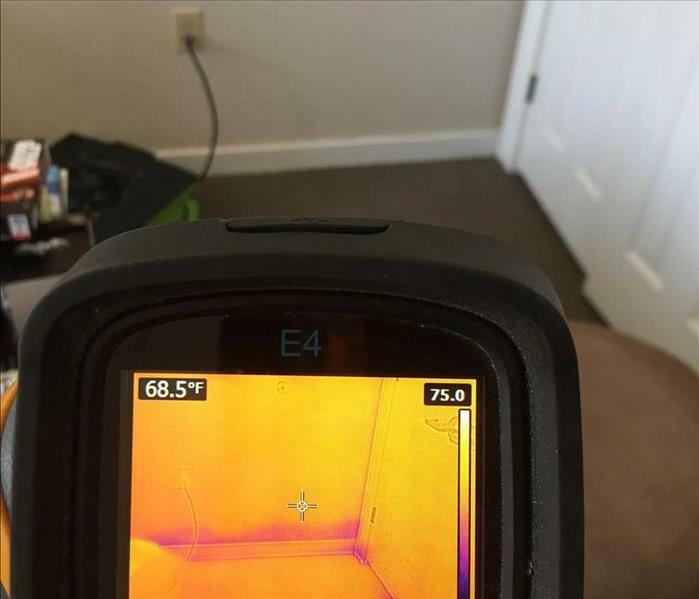 An IR camera can detect moisture located behind interior walls under the right conditions. 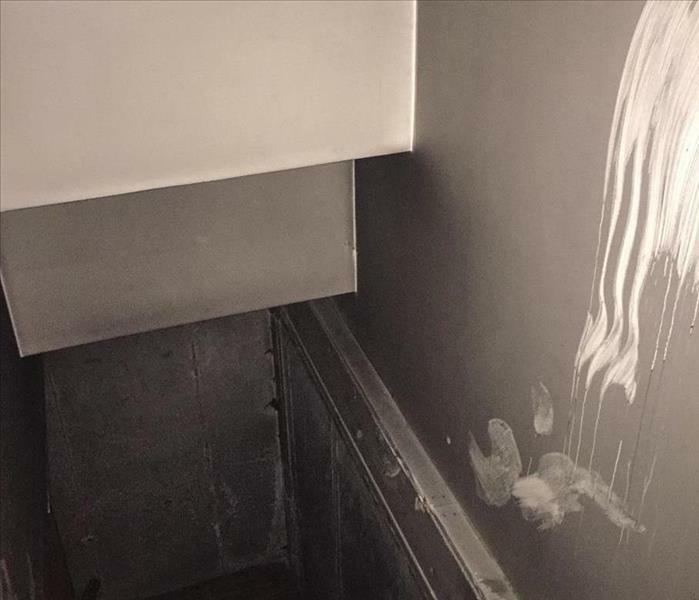 The temperature difference created by the presence of moisture on the inside surface of a wall will appear differently than the surrounding area. Our trained technicians are equipped with the latest technology including infared cameras to identify moisture and water infiltration issues. 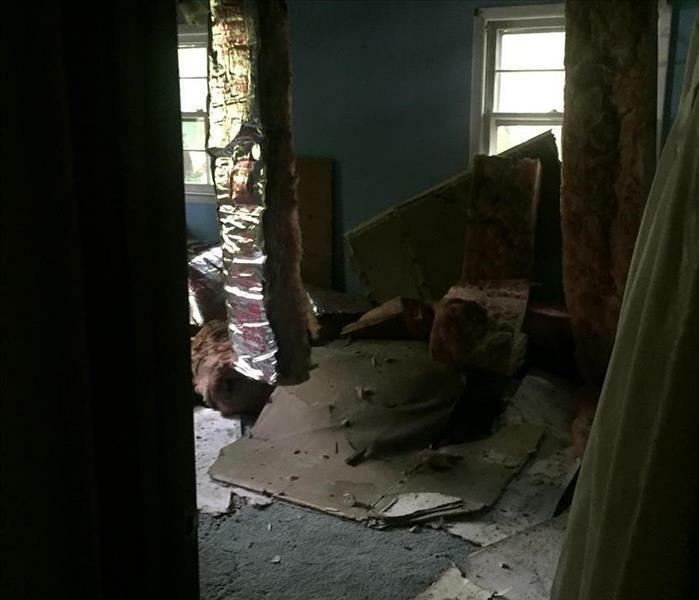 This photo is from a residence that we visited for smoke and nicotine removal. The customer requested our assistance in cleaning and deodorizing the residence due to heavy nicotine contamination. Due to years of smoking inside the residence the entire house was affected. The flat paint allowed nicotine absorption into the drywall, so the walls need to be cleaned and then sealed. SERVPRO of Danbury/Ridgefield has crews trained in smoke cleaning and odor removal. 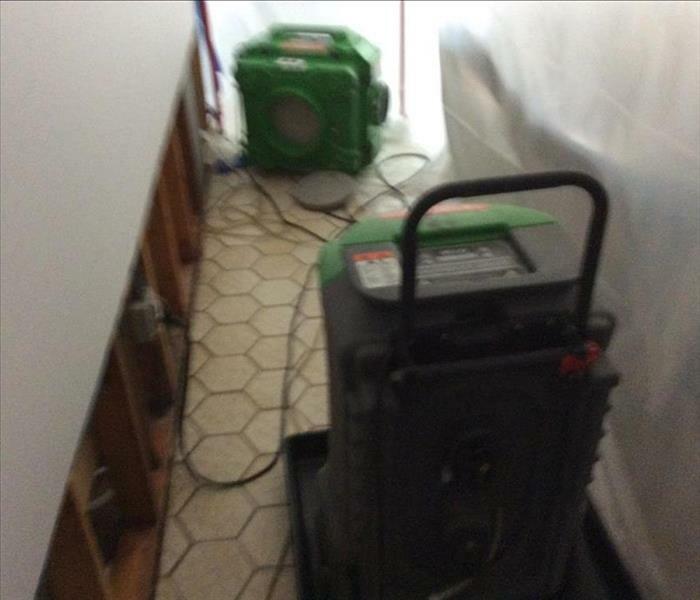 SERVPRO of Danbury/Ridgefield strives to have the latest technology when it comes to water damage restoration. By utilizing our extensive training and technology available we are able to restore vs. replace routinely. 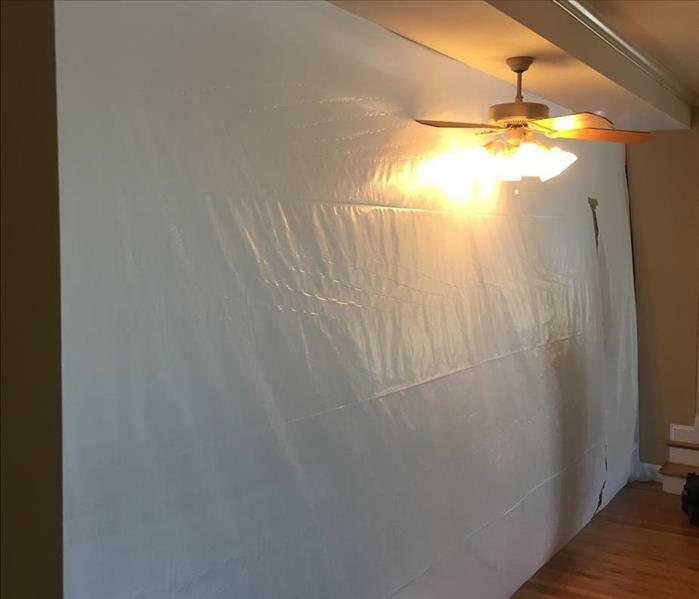 Pictured here is our Injectidry wall drying system which can be setup to either inject dry air into a affected wall cavity or setup to create negative pressure inside the wall cavity to draw the moisture out. Utilizing this technology in an office building in Newtown, CT we were able to save the walls reducing business interruption for the client. When your business or commercial property sustains fire damage, the main concern is restoring your property as quickly as possible to minimize business interruption. Our goal is to get you back in business as quickly as possible, while still providing outstanding service. 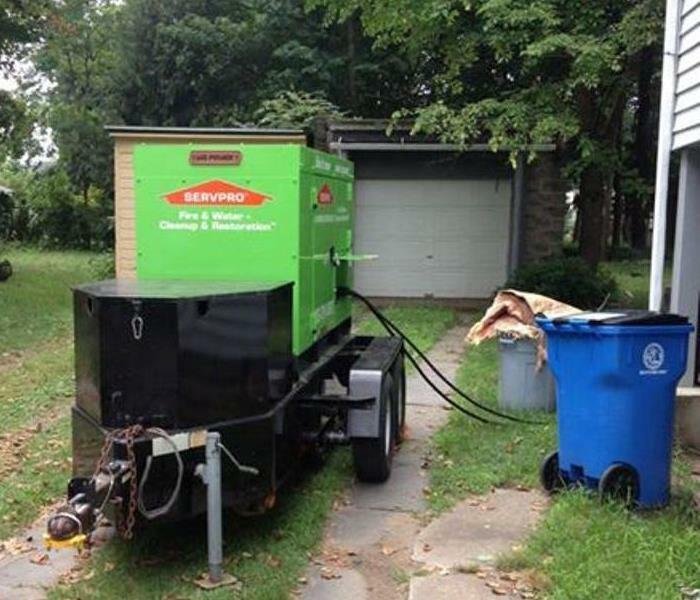 If that requires our crews to work nights and weekends, that's what SERVPRO of Danbury/Ridgefield provides. The peace of mind knowing you have a team of professionals geared to help restore your business after a fire damage is what SERVPRO of Danbury/Ridgefield provides This loss SERVPRO of Danbury/Ridgefield worked closely with the contractor to restore this Ridgefield business back to normal. 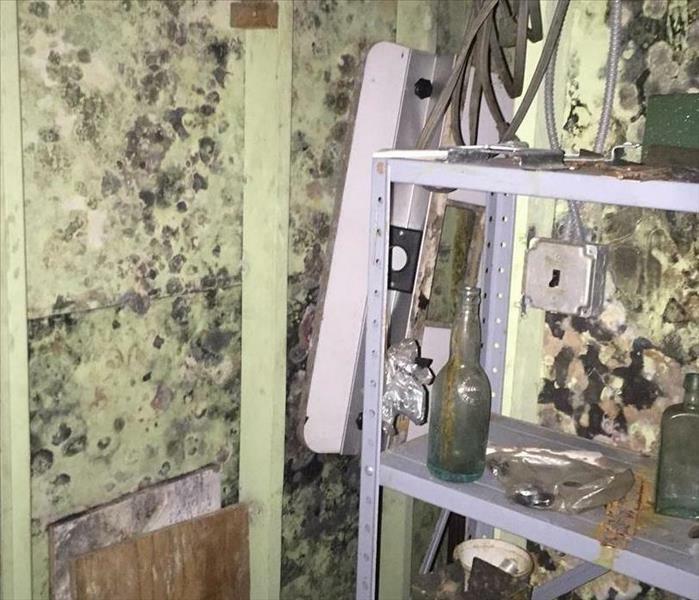 This photo is of a mechanical closet of an apartment complex in Danbury, CT that sustained water damage which fostered mold growth. Many times its the slow leaks that cause the most damage. Water damage that goes unnoticed in closets or underneath/behind cabinets are perfect breeding grounds for mold. SERVPRO of Danbury/Ridgefield can identify moisture issues and create a plan to mitigate the damages. 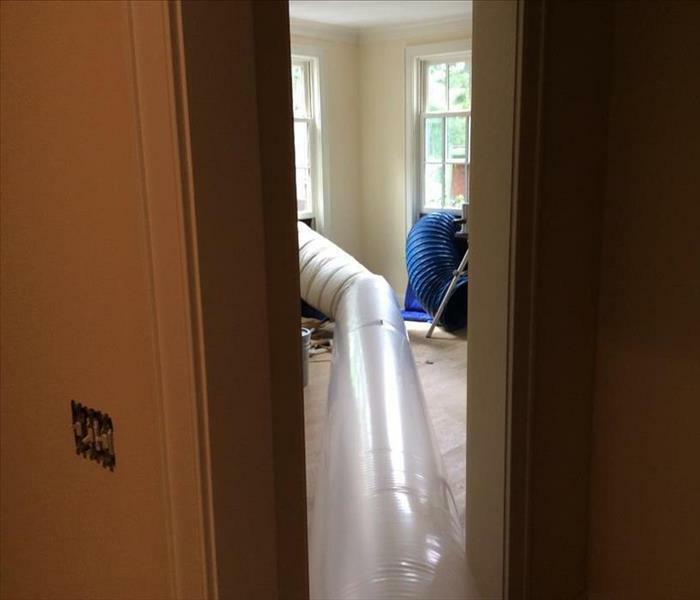 This photo is of a small, slow leak that the homeowner assumed would dry naturally. 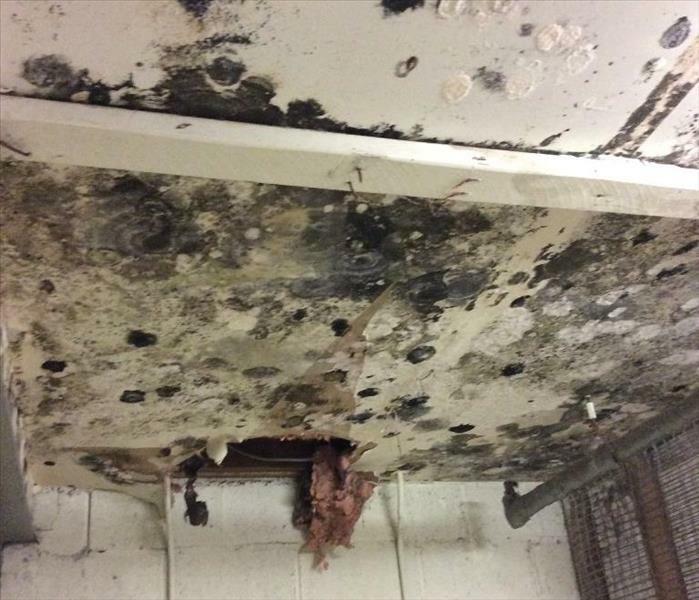 After a few weeks the ceiling started to become discolored and mold began growing and colonizing. Even the smallest leak, left unchecked can cause further and more extensive damage. 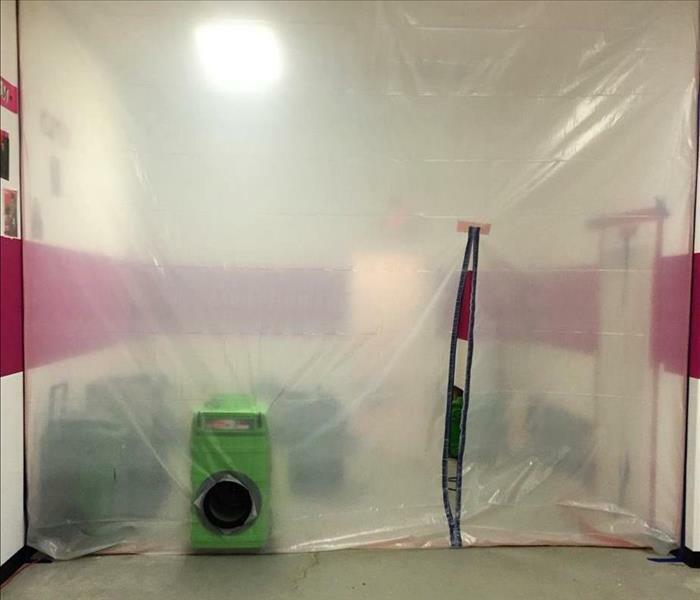 SERVPRO of Danbury/Ridgefield was contracted to setup airlock chambers and remove the damaged ceiling and insulation to prevent any further mold growth in a Danbury CT apartment complex. This photo is from a loss in Danbury, CT where a tree fell on the house, causing significant roof damage. Following a rainstorm water infiltrated the residence causing further damage. It is crucial that when your roof is compromised, even slightly, to have it addressed to prevent further damage. SERVPRO of Danbury/Ridgefield provides roof tarping and board-up services to help reduce any secondary damage. In addition to performing fire, water and mold damage cleanup services SERVPRO of Danbury/Ridgefield also provides climate control and specialty drying services. This photo was taken on a construction project, the hardwood flooring throughout the residence had elevated moisture levels, preventing sanding and staining. The construction company contacted SERVPRO of Danbury/Ridgefield and after an onsite inspection we setup our desiccant drying trailer. This unit is capable of removing moisture more effectively than LGR dehumidification. Within 3 days the all the hardwood flooring throughout the residence was returned to normal moisture levels, allowing construction to continue. 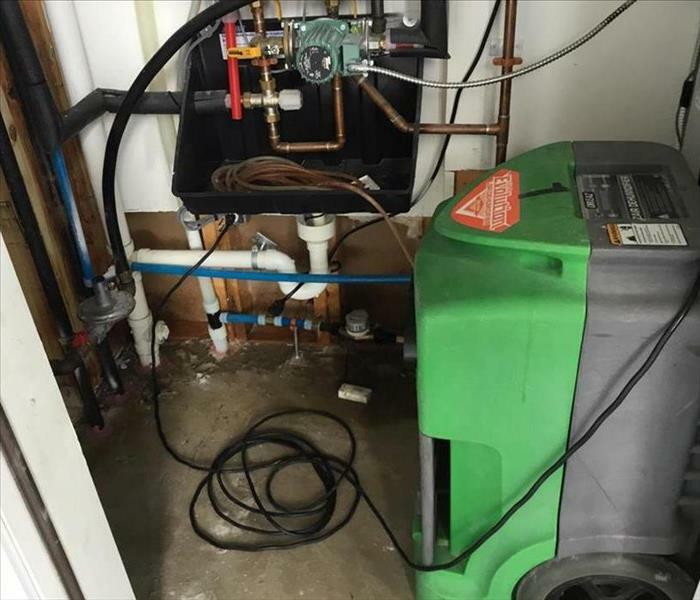 SERVPRO of Danbury/Ridgefield has several different extraction machines that we can employ during a water damage situation. We have a combination of truck-mounted and portable flood extractors, capable of removing a significant volume of water. Here we utilized a truck-mounted extraction machine and a weighted tool to remove over 300 gallons of water from the carpet and padding. 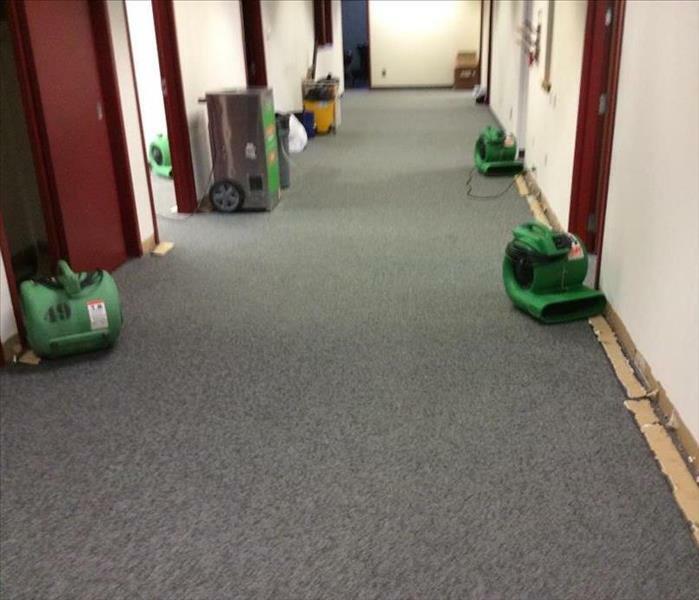 This photo is of a water damaged office building in Bethel, CT. SERVPRO of Danbury/Ridgefield extracted all of the standing water and detached the vinyl cove base to dry the affected wall areas. After 3 days of drying all affected building materials were returned to normal moisture levels. Drying the materials in-place reduced costs and downtime for the property owner. 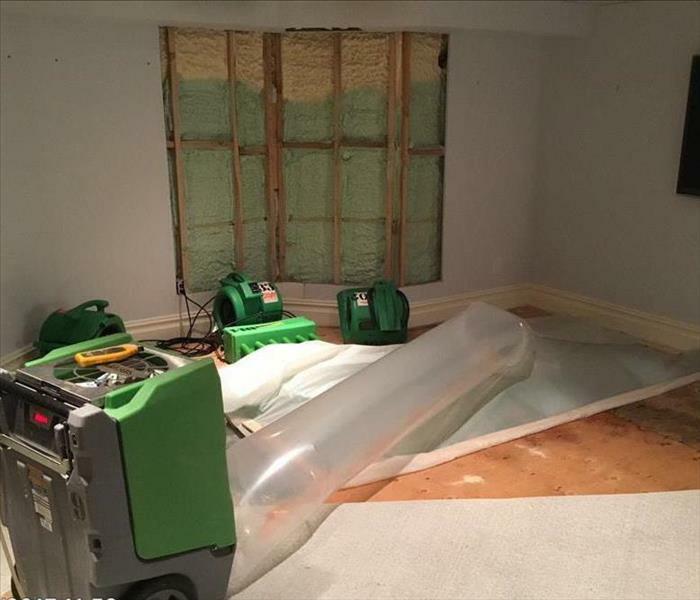 Did you know that SERVPRO of Danbury/Ridgefield has a insulation vacuum? This unit allows our technicians to remove water, fire or mold damaged blown-in insulation quickly and effectively. This eliminates the mess inside as all the insulation is sucked into the machine and the large collection bags retain all of the insulation removed. We have the specialty tools and equipment to handle any disaster. This containment barrier was installed on an ice dam loss due to an snow/ice storm. 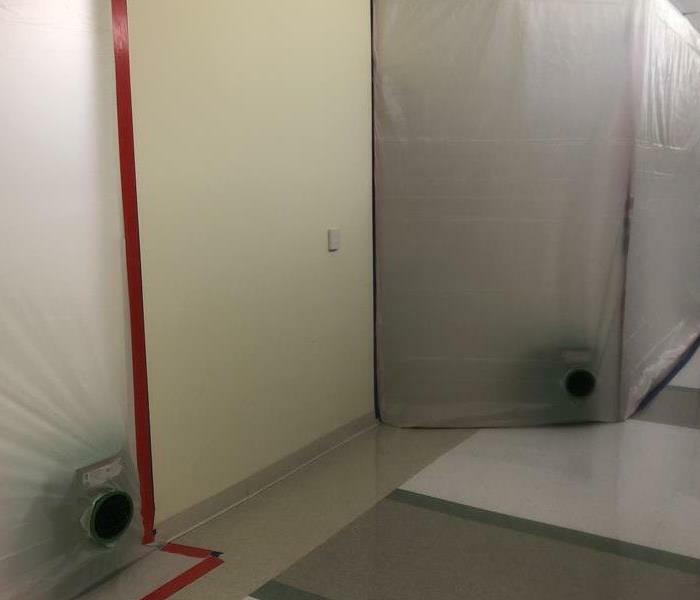 Utilizing a containment barrier allows prevents cross contamination into unaffected areas. The containment barrier also reduces the size of the drying chamber, allowing for more rapid drying of the affected areas. Drying water damaged hardwood flooring can be difficult without specialty equipment. 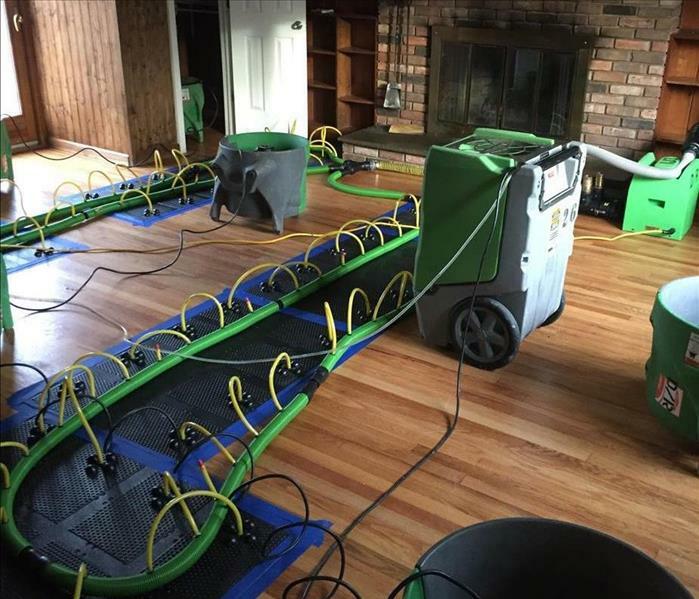 Luckily the trained technicians at SERVPRO of Danbury/Ridgefield have the equipment to effectively dry hardwood flooring. Utilizing the Injectidry trapped moisture drying system moisture is removed from the flooring and subflooring. The Injectidry system uses negative pressure to pull moisture and air through the flutes of the flooring, drying the subflooring and bottom of the hardwood floor. SERVPRO of Danbury/Ridgefield takes pride in reducing response time and providing mitigation services faster than our competitors. Part of this initiative is having our storm & commercial response trailer available for rapid emergency response. 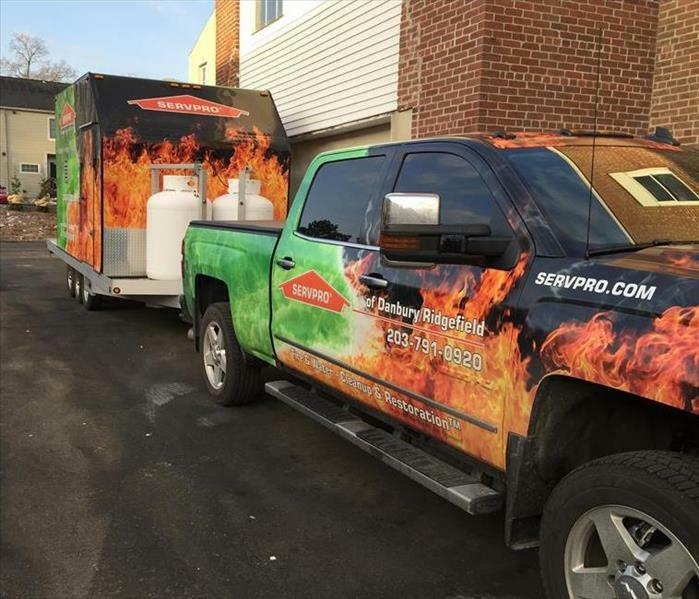 Whether a fire, water or storm damage event, SERVPRO of Danbury/Ridgefield has a trailer loaded with equipment and supplies to handle large losses. This trailer allows us to mobilize immediately, saving time and minimizing damages. If you have an emergency contact our office at (203)-791-0920. 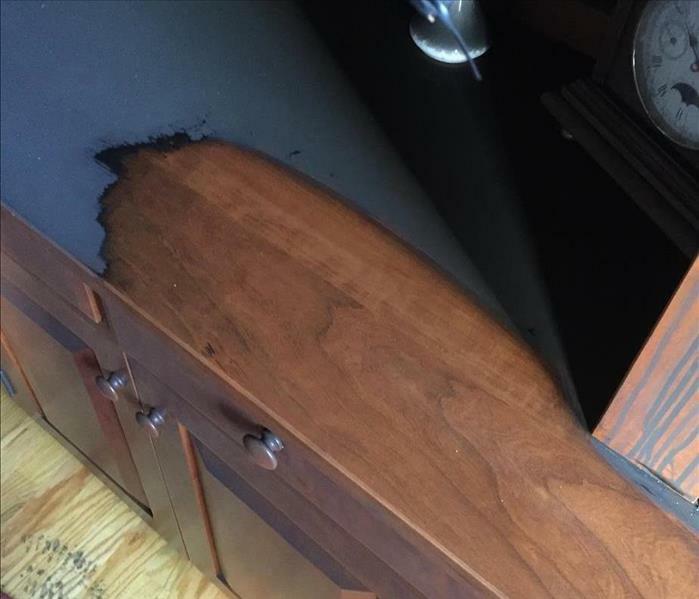 This china hutch sustained significant smoke damage after a fire in an adjacent room. 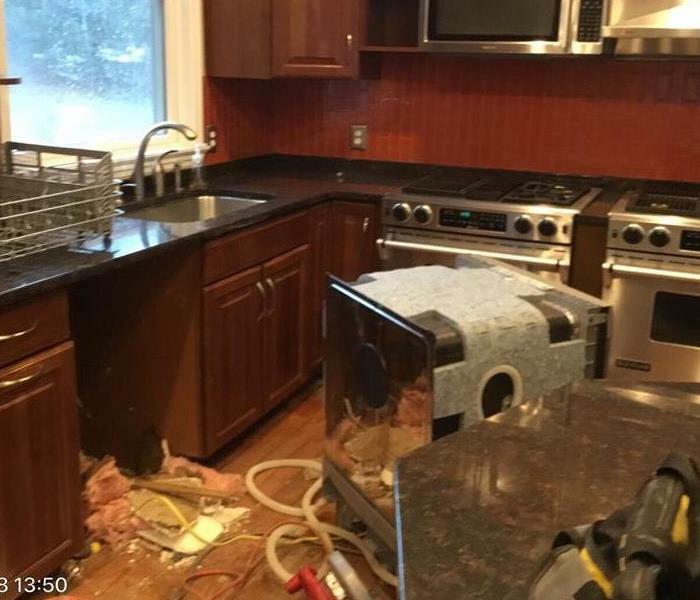 SERVPRO of Danbury/Ridgefield inventoried the damaged content items to assist the customer with the claims process. During the inspection process, SERVPRO of Danbury/Ridgefield's technicians determine items that can be properly cleaned and deodorized. This piece of furniture had sentimental value, and SERVPRO of Danbury/Ridgefield inventoried, packed, and moved the item back to our warehouse for proper cleaning, deodorization, and storage. Did you know that SERVPRO of Danbury/Ridgefield provides contents packing and inventory after a fire/water or mold emergency. Utilizing the latest technology our technicians inventory all items being removed and pack those items for storage at our warehouse. 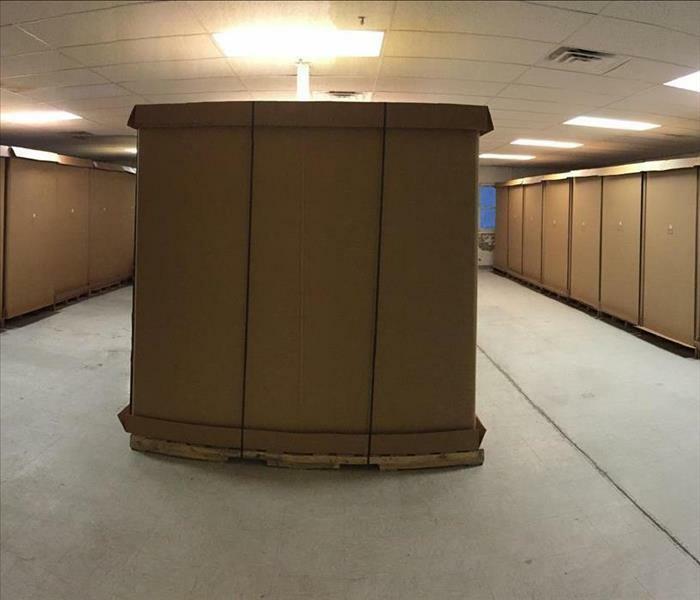 Upon arrival at our warehouse, the items are packed into storage vaults in our climate controlled, secure warehouse for storage. Once your home or business is repaired, content items are brought back. 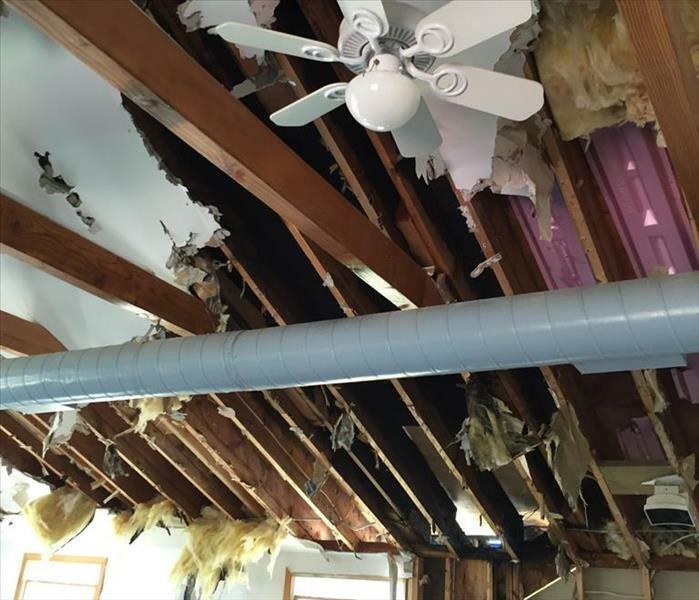 Did you know that SERVPRO of Danbury/Ridgefield provides building stabilization services after storm events and water/fire damage emergencies. These services include power generation, dehumidification, heat or air conditioning to commercial properties. 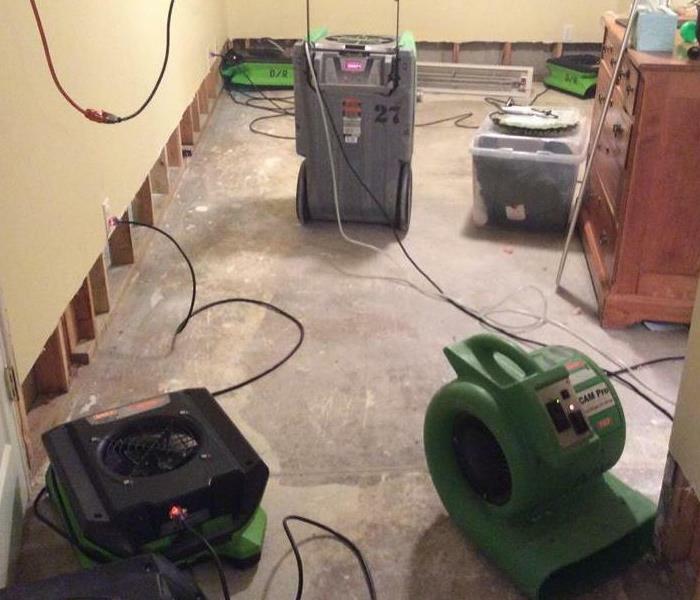 After storm or water damage it is crucial to immediately start the dehumidification process, preventing secondary damage due to excessive humidity. Contact SERVPRO of Danbury/Ridgefield at (203)-791-0920 to hear more about these services. One of the most devastating events that can affect your home in Danbury is fire damage. In addition to generating thousands of dollars worth of damage, fires can destroy your valuable possessions and cause unwanted water damage. In many cases, homeowners become anxious and feel a sense of hopelessness when they witness the depth and scope of their fire-damaged property. However, hiring a restoration company like SERVPRO can limit your losses and restore your equilibrium. Mold in a home can be a very serious ordeal. While there are several things that affect whether your home has mold growing or not, the development of mold comes down to just a few things. Most of the time, if you're diligent and progressive about your problems, you can prevent mold from occurring. However, if you don't take care of the problem, you'll never get rid of the mold- it'll keep coming back time and time again, even if you repair the area that was moldy or decayed. Because of this, it's imperative to take care of the issue in a timely fashion to ensure that your home isn't the cause of many expensive repairs. Microscopic mold spores naturally occur almost everywhere, both indoors and outdoors. This makes it impossible to remove all mold from a home or business. Therefore, mold remediation reduces the mold spore count back to its natural or baseline level. 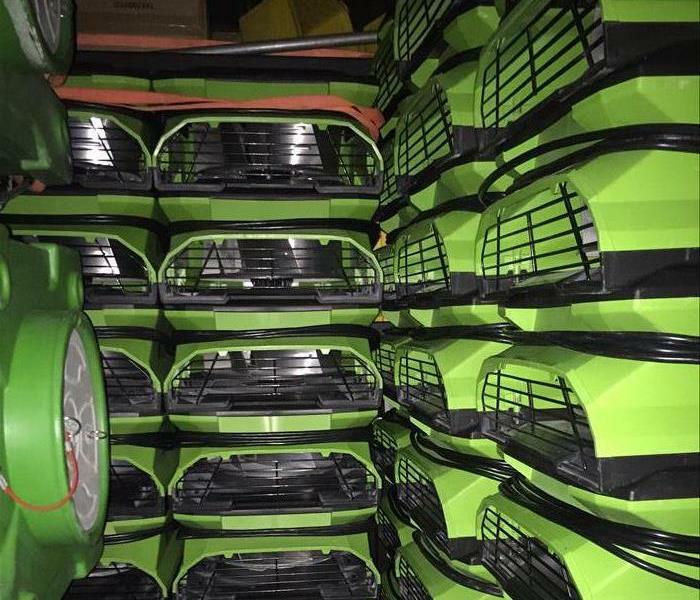 SERVPRO has specialized mold removal equipment and trained technicians to get the job done right. It only takes a small water leak, or even excess humidity, for mold to form in your Danbury home or business. Then, mold can spread quickly through the property in as little as 48 hours. Mold can produce allergens and irritants, and it has the potential to cause other health effects. If your home or business has a mold problem, we can inspect and assess your property and use our specialized training, equipment, and expertise to remediate your mold infestation. We are water removal and cleanup specialists and are ready to service your Danbury home when flooding or water leaks cause water damage. We quickly dry your property using state-of-the-art water removal equipment and advanced drying techniques, documenting the drying process to make sure your property is dry and the job is done right. 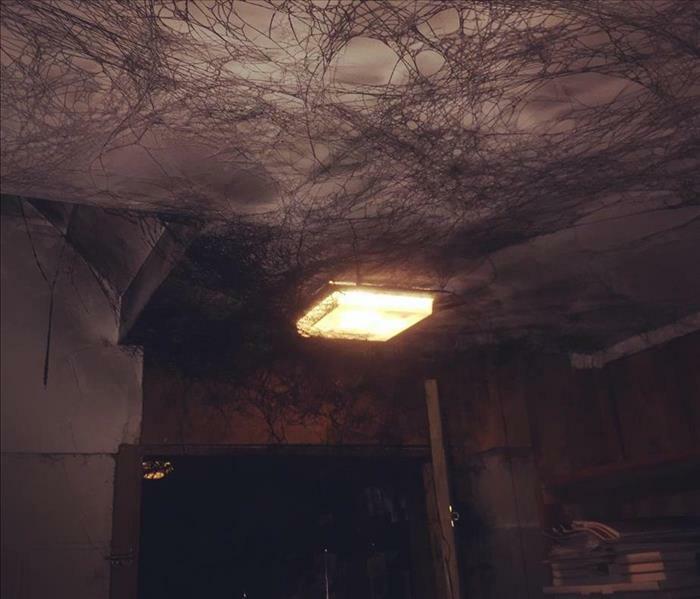 Halloween decorations in the basement? 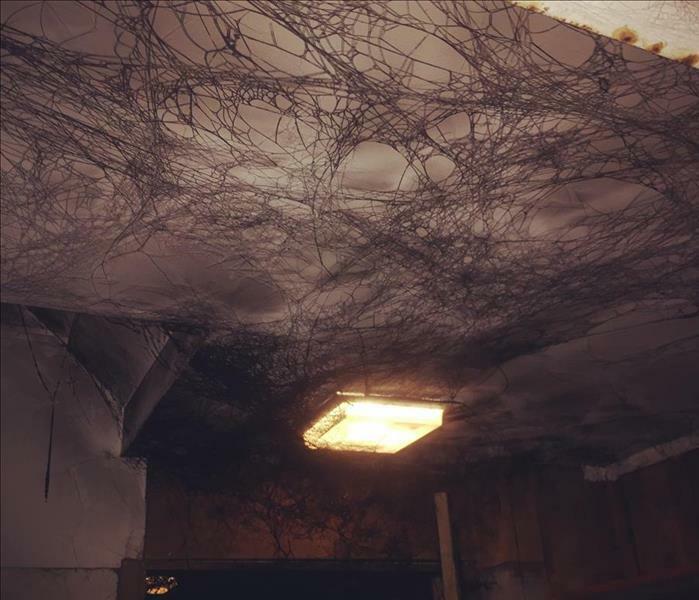 No, this is soot webs created when the furnace malfunctioned and "puff-backed" causing unburned oil and particulate to fill the basement and upper levels of the house. These soot webs are greasy and need specialty cleaning services in order to remove them and the odors associated. SERVPRO of Danbury/Ridgefield has the trained staff to properly clean your soot contaminated materials. Water from sewer system backups should be considered very dangerous. The water is grossly unsanitary and may contain bacteria and viruses that could cause serious illness. Special training and equipment is necessary to safely clean this type of contamination. Contact SERVPRO of Danbury/Ridgefield at 203-791-0920 for all of your disaster needs. SERVPRO of Danbury/Ridgefield is the go-to restoration vendor for the medical profession. Using specialty drying techniques we are able to dry faster, with minimal demolition allowing for affected areas to be re-opened quicker. 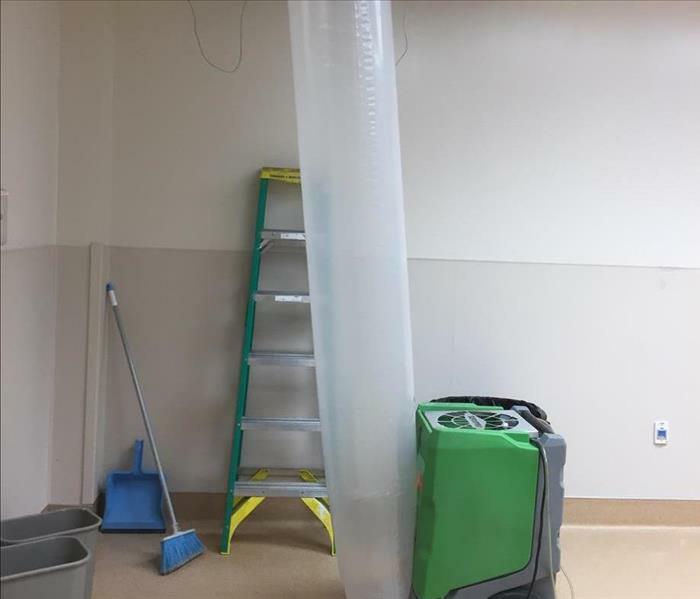 Ducting the warm, dry air from the dehumidifier into the affected ceiling we were able to dry the ceiling in 24 hours, allowing the surgical center to continue business as usual. 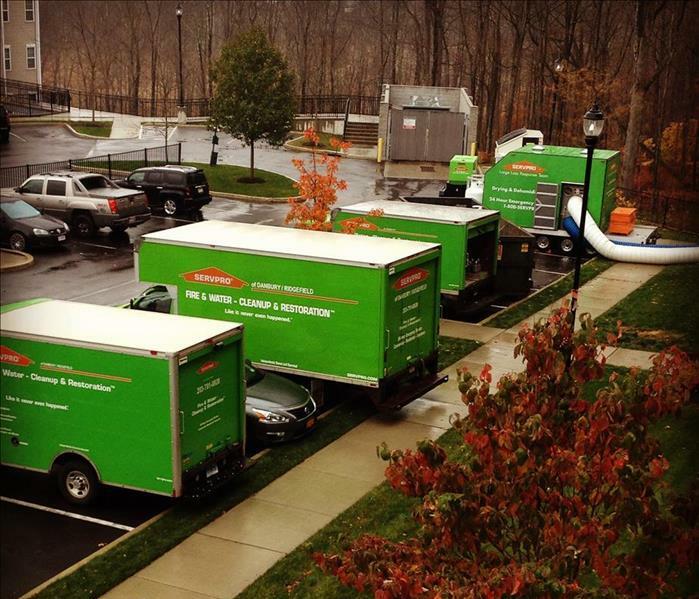 SERVPRO of Danbury/Ridgefield is equipped to handle small and large scale water damage emergencies in the greater Fairfield County area. With the experience, manpower and equipment we will get this water damaged home dry and back to normal quickly. 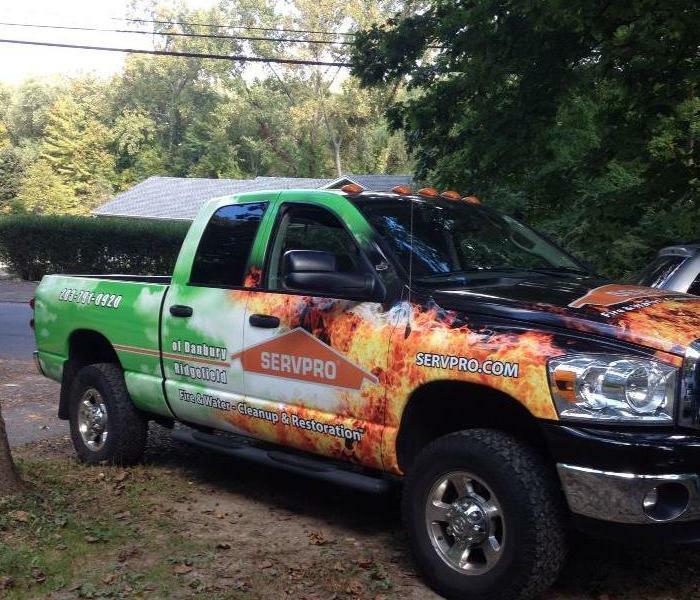 Trust the team of professionals at SERVPRO of Danbury/Ridgefield to handle your water or fire damage emergency. Contact us directly at 203-791-0920. 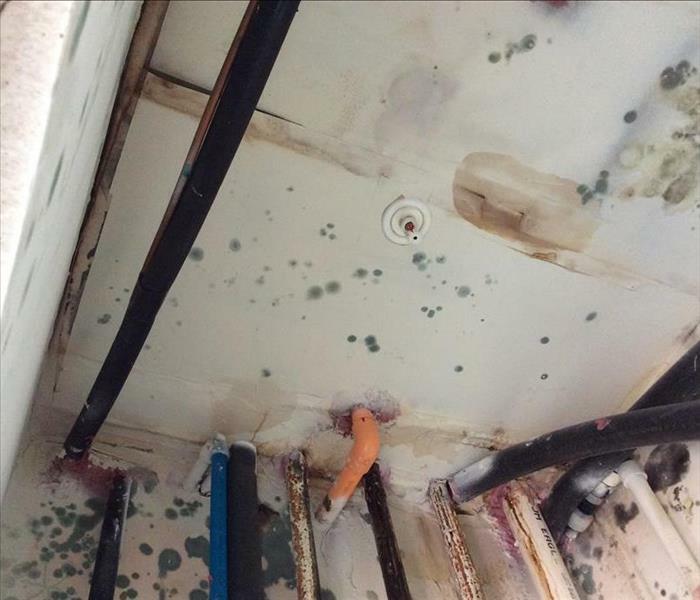 SERVPRO of Danbury/Ridgefield was contacted to perform an inspection and estimate for a vacant home that sustained major water damage and mold growth. When leaving properties we recommend that the water main to the house be shut off to help prevent substantial damage from a pipe break or leak. This Danbury CT residence will be professionally remediated and brought back to pre-loss condition. SERVPRO of Danbury/Ridgefield is proud to announce the addition of this Dodge Ram pickup utilized for production and trailer hauling. 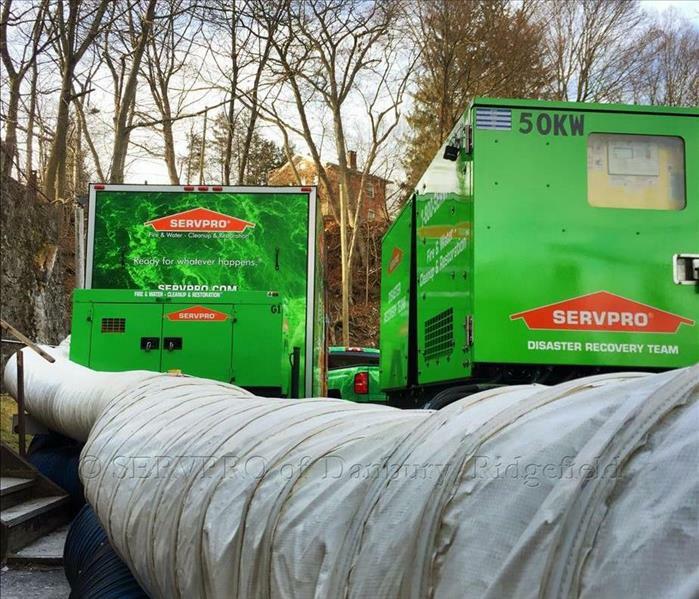 SERVPRO of Danbury/Ridgefield has two diesel generators in our Danbury warehouse available for large scale drying projects or to provide temporary power during a storm situation. If you need our services please contact our office at 203-791-0920. 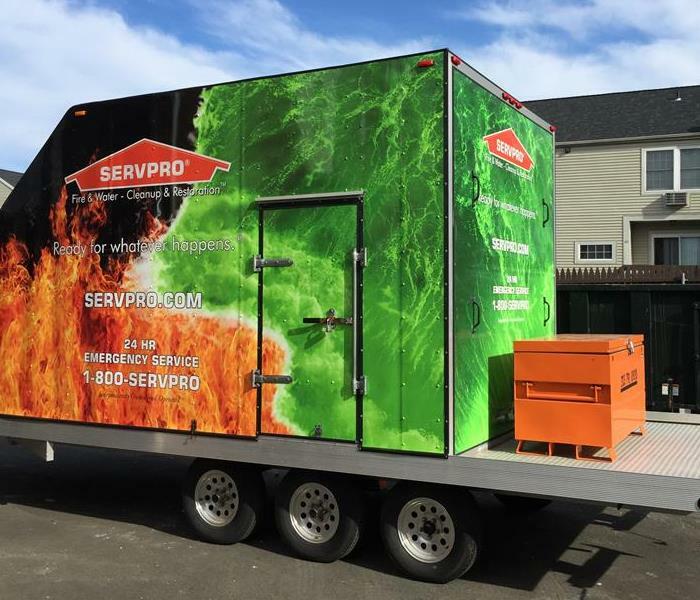 SERVPRO of Danbury./Ridgefield has purchased a drying trailer which is capable of handling large commercial structures that have sustained water damage. With a 20kw generator on-board we are able to begin drying efforts without any power in the structure. SERVPRO of Danbury/Ridgefield is pleased to announce the addition of another pickup truck to our fleet. This vehicle is capable of towing our commercial response trailers along with our large generators. 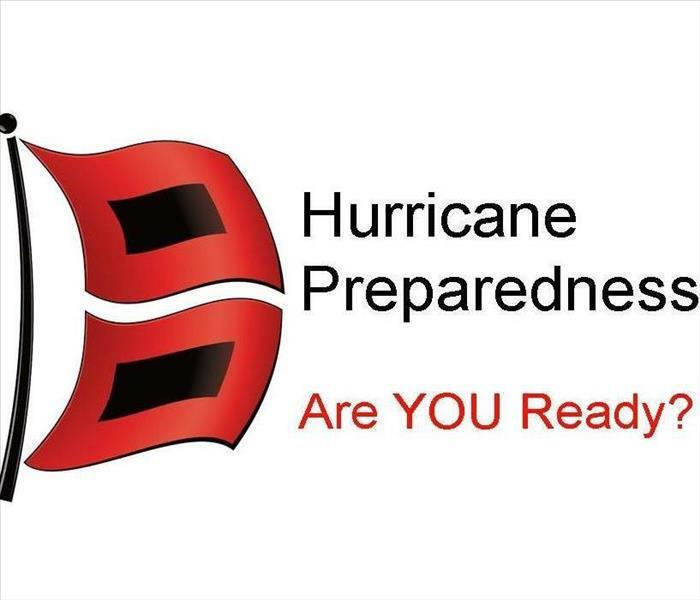 With the ability to respond to a disaster immediately we are able to assist in minimizing damage. 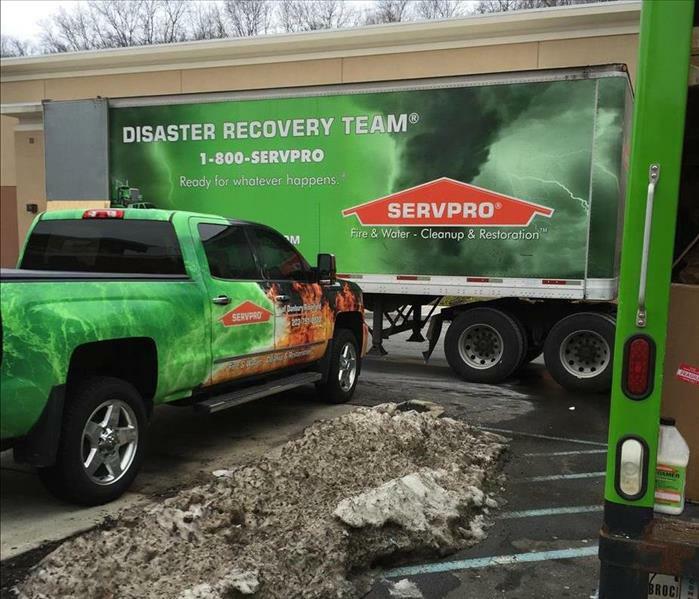 With disaster recovery trailers loaded and ready to respond at a moments notice, SERVPRO of Danbury/Ridgefield has the capability to handle large and complex losses. SERVPRO of Danbury/Ridgefield is prepared and has the experience to handle your disaster. Every year, SERVPRO of Danbury/Ridgefield is honored to give back to our local communities and participate in the area fire prevention days. We hand out informational pamphlets along with fire prevention coloring books to help educate families on fire safety. 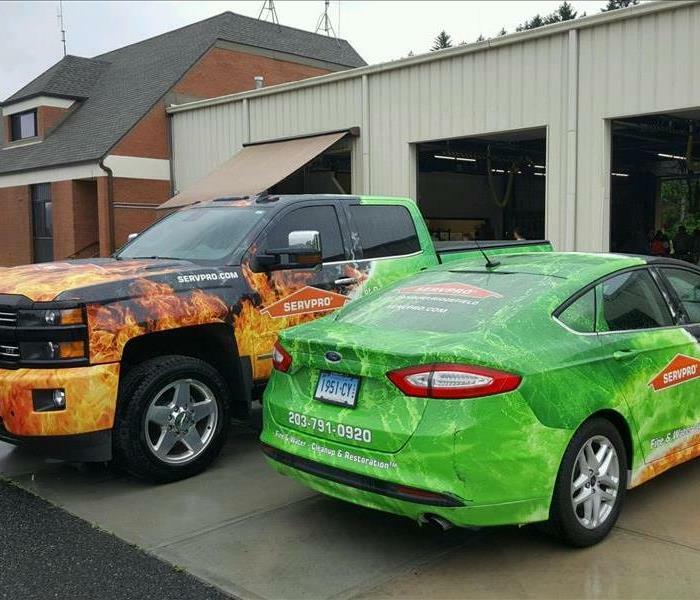 Whether its a call at 9am on a Monday morning or 6pm on a Saturday night, SERVPRO of Danbury/Ridgefield has the crews, vehicles and equipment to respond to your fire damage or water damage disaster. With trucks and trailers pre-loaded with equipment and supplies we are able to reduce our response time to help you in your time of need. Here is our new production vehicle that we have added to the SERVPRO of Danbury/Ridgefield fleet. 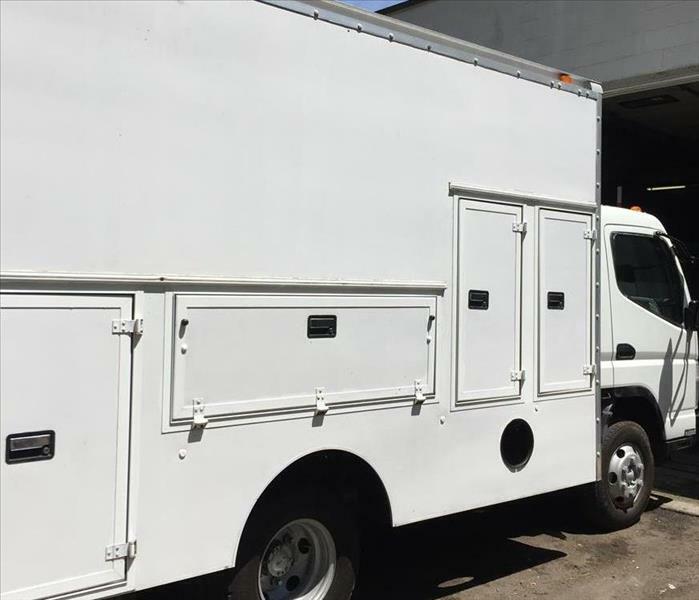 This box truck will be pre-loaded with equipment to quickly respond to your fire damage or water damage emergency in the greater Fairfield and Litchfield County areas. Stay tuned for updated pictures once the truck is painted SERVPRO green. 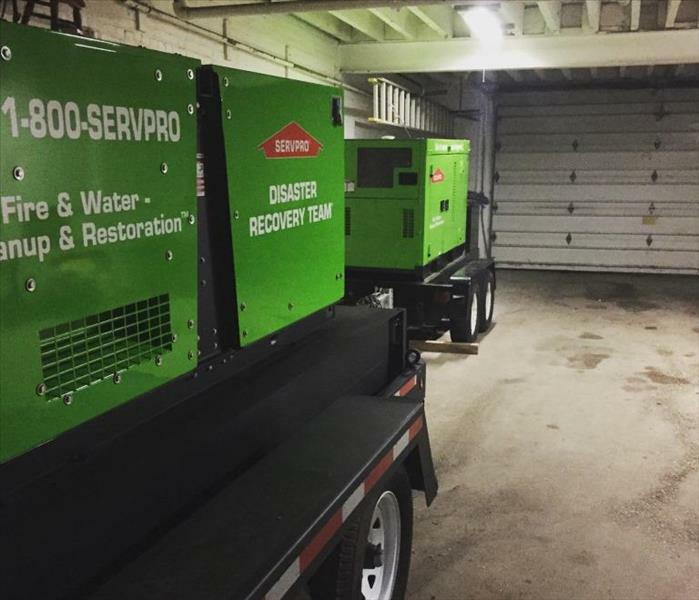 SERVPRO of Danbury/Ridgefield has 2 diesel generators at our warehouse ready to respond to your water damage or fire damage emergency. These generators are utilized when the damage is severe and the power has been disconnected from the structure, or when there isn't sufficient power to run our equipment. 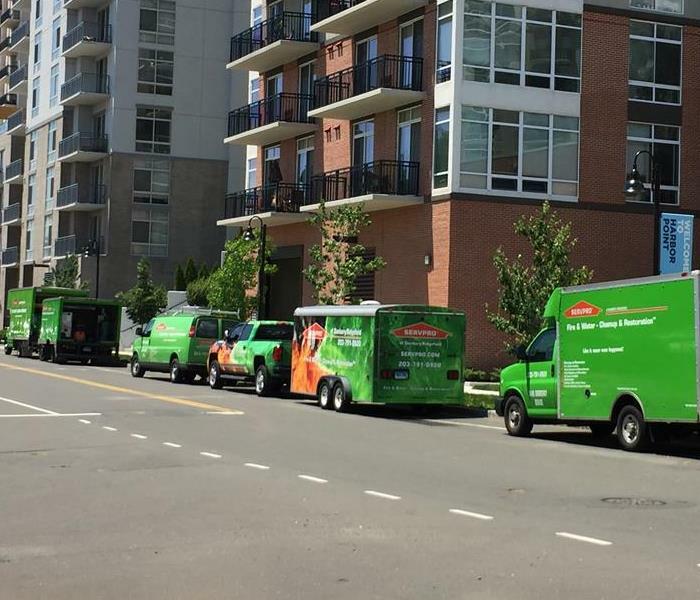 Rest assured that no matter the situation, the professionals at SERVPRO of Danbury/Ridgefield have the equipment and experience necessary to help guide you through your disaster.